The reasons for developing strategic alliances become apparent when you understand the benefits. This applies to businesses and organizations of all sizes. Your reason for developing an alliance could be for research, production, marketing, distribution, or management. Your increased capability for success through alliance relationships will encourage your continued embracing of the practice. The same holds true, regardless of whether you enter strategic alliances as an individual or organization. Many of the benefits create high value for different segments of the distribution chain rather than all the segments. I’m not going to specifically tell you which benefits from developing strategic alliances relate to manufacturers, wholesale distributors, retailers and service organizations. The reason is that I do not want you to limit yourself. As I regularly share in my seminars, innovation can be creating a new wheel or adapting another’s idea to your situation. What’s in it for you? Maybe everything listed below or maybe only a few benefits. How much benefit you receive will be a function of your self-imposed limits, or hopefully a lack them. Your core strengths may lend you to develop alliances in only a few areas, and that is just fine. Or, you may desire to develop alliances in many areas over time. Work hard to develop Outrageously Successful Relationships (OSRs) in all your alliances. Following, you will discover what’s in it for you, if you develop the right alliance, with the right people. You will also discover quite a number of strategic alliance examples. An exchange of technology to compliment your core strengths shores up your core weakness and improves production capabilities to better serve customers. An example of this type of alliance is the alliance of Kinko’s Service Corp. of Ventura (now FedEx copy centers) and Xerox Engineering Systems to establish a nationwide network for faxing large-format documents. This service is especially valuable to architects, contractors and advertising agencies. Kinko’s gets a revenue boost and Xerox gets additional placement and unit sales. Technical hotlines and on-site technical support are regularly available from suppliers with whom you’ve developed alliances. To receive a technological contribution or possibly a technological edge in your industry like the alliance between IBM and Apple to develop a new computer operating system that allows both hardware formats to communicate, or like Nynex Corp. and Philips Electronics who joined to develop screen telephones for residential use. Learning curve commitment. Cost savings are passed along as experience is gained in producing a new product, and discounts are available on start-up products to encourage early sales. Better sales and technical training for your employees is an important benefit in partnering with your suppliers. More manufacturers and distributors are developing training programs for dealers. Guggenheim Dental, a dental supply distributor inHawthorne , CA is now regularly offering training programs for their top customers. Recently, at a seminar I delivered for the National Nutritional Foods Association, I suggested to the retailers that they only buy their nutritional supplements from suppliers that offer training videos. This is an added benefit in the seller/buyer relationship. Co-branding such as snack manufacturers who are now mixing two nationally known names and logos on a single product. Examples of this are Betty Crockers’ Soda-Licious, soda pop fruit snacks, made with 7UP and 7UP Cherry. Also, is the popular milk chocolate-covered Pretzel Flipz by Nestlé featuring Rold Gold pretzels. Access to new markets both domestic and international. Copeland Corporation joined with the largest compressor manufacturer inIndia , Kirloskar, to bring air conditioning to a growing middle class. You will find that partnering can provide the benefit of positioning for future needs not yet known to you or your industry. An example, a lead-user firm is one whose present needs will reflect its segment’s needs in future months or years. Through partnering, one company can assist another in leapfrogging current industry leaders. Cooperating with newer firms more willing to pursue a riskier development strategy to gain market shares does this. This strategy can aid companies, large and small, in more rapidly and efficiently reaching their collective goals. Additional business to justify operating a production facility. In developing strategic alliances with competitors, you might do the production for both. This is similar to retailers that have a store brand developed by the recognized national brand manufacturer. Opportunity to develop a private labeling or branding identity. American Dental Cooperative in Nashville has been successful in this area as has Power Heavy Duty in the heavy-duty truck repair industry. Sales lead and help in procuring new business. Brian Potts, a VP at 3M recently made this offer to his strategic building service contractor customers at their CEO retreat in Mexico . He detailed how other 3M divisions are most likely are selling the customers that the contractors seek and how they could take advantage of those already established relationships. Opportunity to expand business with new or related product innovations and service offerings. Later in the book I’ll tell you about how Helen Chavez at La Tapatia Tortilleria did this. Preferred supplier status as Steelcase in Grand Rapids , MI , awards to suppliers that have proven their performance abilities. Reduce direct competition as the Sun/IBM alliance has attempted in creating the Java operating system to keep Microsoft at bay. To gain market share, Lexus and Coach, the New York-headquartered manufacturer of fine leather products teamed up in an exclusive partnership to produce the Limited Lexus ES 300 Coach Edition. Geographic expansion is what happened to Ronald Fink’s West Palm Beach , FL company, RGF Environmental Group, following a trip to Asia with other local CEOs and Ray Reddish, a senior management analyst at Florida ’s commerce department. Within 18 months of his trip he had hired 14 new employees just to handle his Pacific Rim business. Some states aggressively partner with local manufacturers to expand exporting there by increasing state revenue. Create marketing synergism to the consumer through cross promotion like Blockbuster and Dominos did. Blockbuster held a promotion that required a customer to rent three movies and in return receive a $10 savings book for Dominos Pizza. Both partners received increased traffic through the joint promotion. This can easily be done at the local level between, as an example, the drug store and the dry cleaners. Barriers to market entry by a new player. This protects the current players as with GTE and Pacific Bell in Los Angeles . They partnered to serve UCLA in a method that closed an opportunity to a new provider attempting to enter their market. Marketing assistance to support order volume for products as when a small company develops an alliance with a large company. Improved attitude toward customer service. This starts from top management on down the chain of command. Many manufacturers are partnering with their dealers and retailers. When the dealer makes a long-term buying commitment to the manufacturer, the manufacturer helps the dealer in customer service tools and training. Improved customer loyalty was developed by United Airlines through their alliance with Starbucks. United now serves Starbucks gourmet coffee to their passengers at 30, 000 feet. And they do it in cups bearing the logos of both companies. Improved product offering becomes possible through alliance buying cooperatives. Additional product lines become available to the members because of the cooperative’s buying strength. Barnett Gershen, CEO of Associated Building Services in Houston builds alliances with his customers through his quarterly review method. Once a quarter he sits down with his customers and asks for a grade or score as to the quality of service his company delivered. He then looks for tactics and strategies to improve his service. Through alliance relationships, many businesses have found strategies to provide better and quicker customer service while keeping their costs manageable. Look for companies that have a similar customer base to yours and enter into a discussion about how to work together. The computer and electronics industries have profited greatly from alliance relationships. Innovation has become commonplace for firms that have chosen to work together. The University of Toronto ’s Innovations Foundation signed an agreement with Northway Explorations Ltd. and Polyphalt, a private Ontario , Canada company, to deliver polymer-modified asphalt materials technology for longer lasting roads to the commercial market. To differentiate oneself from the competition. Steelcase’s alliance with Peerless Lighting, located in Berkeley , California , offers state-of-the-art office lighting. The relationship has brought Steelcase an additional $15 to $35 million in annual furniture sales. Also, they received additional dollars from the light fixture billings. In manufacturing elements of your product or entire product that could be built in plants (owned by others or in joint venture) with up to date technology, cost savings can be great. Sharing resources, or outsourcing, rather than owning and operating a manufacturing plant, will allow a synergistic partnering agreement allows you concentrate on your core strengths. This is the idea behind the Donnelly Corporation and their venture with Applied Films Laboratory, Inc. for manufacturing and supplying the world market in display coated glass for liquid crystal displays (LCDs). In distribution, access to orders that can be economically and efficiently produced also that generates reasonable profit through alliance relationships. Shared locations such as Bank of America and many other banks across the country are that are locating branch offices in suburban supermarkets. They are saving resources while simplifying the lives of their consumers by reducing the amount of their consumers— daily running around. Wal-Mart has a partnering alliance with Ronald McDonald, in their recently completed Wal-Mart store in Oxnard , California . Proudly displayed, are signs on the store’s entrance doors announcing, McDonald’s inside and a life-size plastic Ronald, who sits inside on a bench to greet customers. Stores within stores have become commonplace through alliance relationships. Partnering in a poor economy or recession makes good sense especially, when sales are flat and prices are deflating. Continental Airlines accessed optical industry consumers by partnering with Swan Optical, Inc., an industry supplier, to increase business through an air travel discount certificate program for purchasers of optical frames supplied by Swan. Access to capital is a primary reason for smaller organizations developing alliances with larger ones. An example on a huge scale was when Chrysler went to the U.S. Government seeking loan guarantees. On a smaller scale, Bruce Bendoff, CEO of Craftsman Custom Fabricators, Inc., Schiller Park, IL, a 275-employee sheet-metal bending company learned how to grow through trusting a corporate behemoth—Motorola. Achieving economies of scale is possible in alliance relationships when partners share facilities, equipment and employees. Prompt payment per agreed terms is a standard in customer/supplier alliance relationships. More potential profit is generally the outcropping of shared resources. Alliance relationships allow partners to share the financial risks associated with developing new products and entering into new markets. Working together, American Dental Cooperative members, dental distributors are successfully purchasing goods in parity with the two giants in their industry. Additional discounts and services for in depth marketing and technical expertise. Win/win pricing becomes possible in long-term buyer/seller alliance relationships. Just-in-time inventory purchasing and supplying as exemplified by the famous relationship between Wal-Mart and Procter & Gamble. Home Depot and Dell Computers have also built powerful alliances with their suppliers for cost saving just-in-time inventory. Productivity increases are also achieved through partnering alliances. In a three-year study of Brown & Root/Braun’s alliance with Union Carbide Corp., Danbury , Conn. , B&R/B concluded from 18 projects that productivity on partnering jobs was about 16% to 17% better than previous levels. The Arizona and California Departments of Transportation have so successfully discovered that the partnering approach benefits many industries’ experience, especially, the construction industry, by eliminating the tangle of claims, litigation, and adversarial relationships through a concept of cooperation throughout the life of a project. Identifying potential relationship hazards early was another benefit. Bench marking (companies sharing information on what they do best), especially in the aerospace industry, has shown increased productivity and decreased costs across the board. Putting some pleasure and fun back into business. Jim Eisenhart, president of Ventura Consulting Group, Inc., Ventura , California, says that the big benefit of partnering is it puts pleasure and fun back into the construction business. He says people are now open to partnering because they recognize the limits of old adversarial paradigms. Market intelligence relating to new products, processes, and competitive technologies and markets. 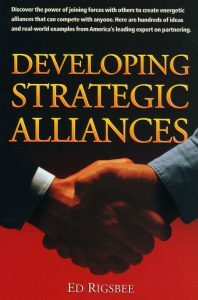 Ultimately the benefit to developing strategic alliances with others is for solutions through mutually beneficial efforts. Together you can solve your problems, those of your customers’ suppliers’ and employees’. Be sure you know what it is that you are want to get out of each of your alliance efforts! It’s rare that a company can be all things to all people. Working in cooperation with others is the solution. Adopting the paradigm of strategic alliances will get you much closer to your goals than without these valuable relationships. Finally, and decisively important, when a company embraces the philosophy of strategic alliances, the result will be improvement in quality, productivity and profitability. And yes, this is done through cooperation and collaboration.